Health science educators are increasingly bombarded with proposals to integrate instructional technology into the curriculum to enhance learning. While it may be that providing more options for delivering instruction in different formats provide instructional benefit for educators, the unique nature and goals of health science education require a systematic and integrative approach when instructional technology is introduced into the curriculum. Providing support for transformative learning pedagogies and high-level learning that assists students in developing a reflective professional identity should be a major goal of instructional technology adoption. 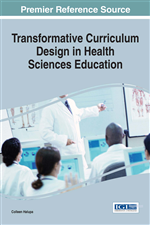 This chapter develops a framework that health care educators can use to guide the integration of instructional technology in a manner that provides instructional affordances for transformative learning and supports instruction that produces reflective practitioners. Teaching knowledge and skills separately or in a decontextualized manner produces fragmented educational experiences. Students should be taught in an environment where knowledge and thinking are acted upon and applied in a particular context. Faculty members must provide linkages between the professional knowledge and the use of that knowledge in the practice setting. The practice of health science, with its combination of knowledge, cognitive and hands-on skills, has a unique transformative nature that requires a unique pedagogical approach. As a number of health educators such as Benner (1984), Noone (2009) and Berragan (2013) have pointed out, health professions require education for practice. Curricula and instruction must be designed to deliver professional education in a contextualized fashion that links knowledge, skills and ethical and reflective practice behavior. One unique perspective on learning is Jack Mezirow’s transformative learning theory, which has been developed over the last several decades. His theory is specific to adult learners and focuses on learning mechanisms involved in creating perspective change or what has also been called a change in frames of reference. Transformative learning requires an ability to reflect on interactions with others in critical discourse as well as the ability to self-reflect. The goal of transformative learning is to produce more adaptive and efficient frames of reference that allow for engagement in reflective thinking. The unique focus on both mental and educational processes that enhance the ability to reflect and engage in productive discourse make transformative learning theory particularly relevant to health sciences education. Increasing calls to educate health science students to be reflective practitioners have led to the exploration of a number of theories and pedagogies. Transformative learning theory with its emphasis on changing and adapting frames of reference through critical discourse and critical reflection on content and personal assumptions holds significant relevance to the development of reflective practitioners. Explorations of transformative learning theory in the health sciences have focused primarily on the mechanisms posited by Mezirow to lead to changes in frames of reference or meaning schemes. Transformative learning events as described by Mezirow (1992) are those that cause students to undergo a shift in the way they think and act.